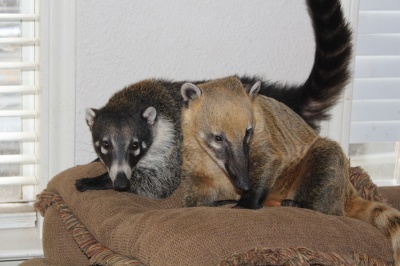 What a way to start this Coati Christmas day! Scrambled eggs and pears for breakfast Yummy!!! 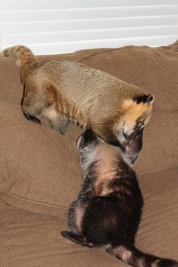 Then some special playtime with CoatiMom, (she loves me the most, because I am the favorite!) 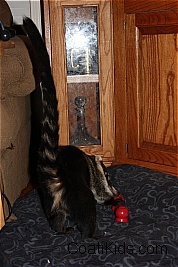 CoatiMom and Dad had a very special present for me..Kong toys! 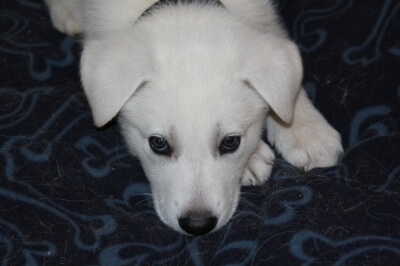 I like to chew on them and search the special little pockets in them for treats. 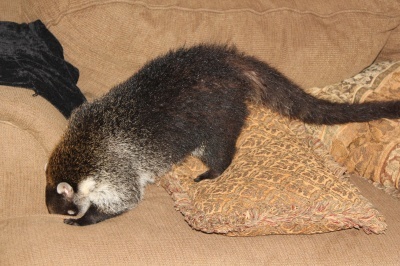 I liked my present so much that I ran behind the couch and came out with CoatiMom’s missing glasses. Was she ever happy with me. 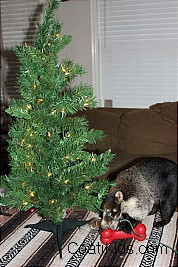 I knew where Clyde hid them…I really didn’t want to fight all that mall traffic, so this was my present to CoatiMom and CoatiDad too, because now he doesn’t have to buy her new glasses! 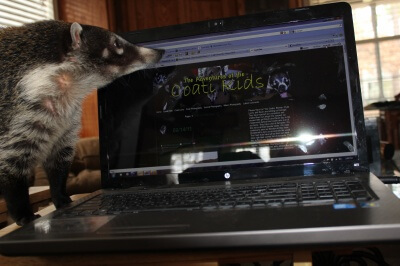 WoW look what Coatimom did for us. 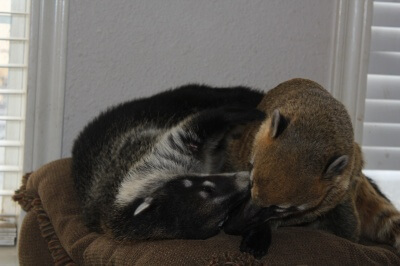 We have lots of toys and fun stuff and plenty of visits from Coatimom and Dad but, this is pretty cool. 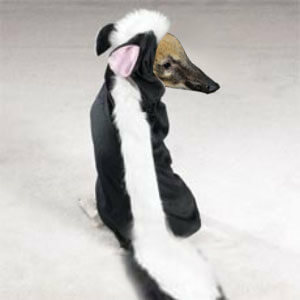 CoatiMom knew we are curious. She put in some live entertainment for us. 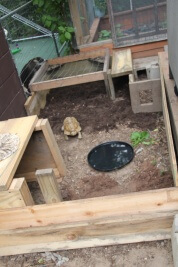 I don’t understand why the tortoises can’t come over for lunch *winks*. She put them just out of our reach darn it! 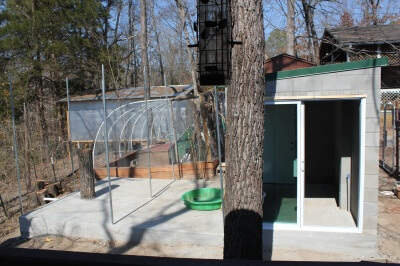 Apparently there is a new man in the tortoise ranch and he gets a pen to himself. 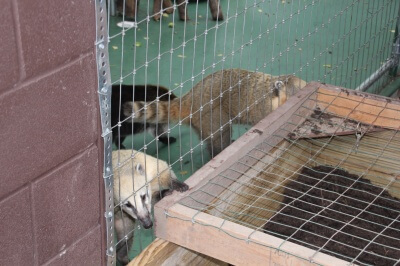 Not even sure why she bothers with those silly shelled cows,Coatis are much better pets! I have something to say……. 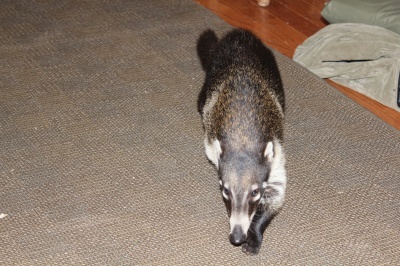 The time has come for me to respectfully decline my term as matriarch of Coati Cottage. 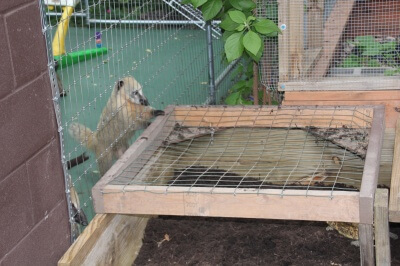 In my place please join me in nominating Honey. 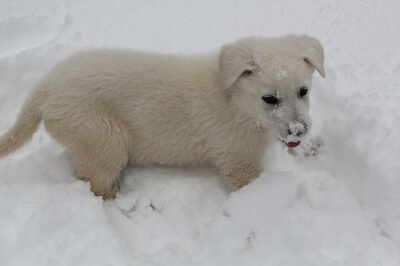 Honey will be a fine leader. Honey knows how to keep Clyde in line. She is sweet and kind to Lucky and my best friend. Oh she also keeps Bonnie from bossing everybody else around. 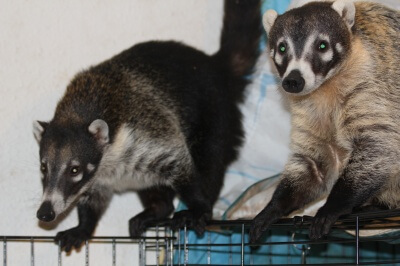 I know she won’t let Clyde get away with hogging all the eggs, chicken meat and other good stuff out of everybody’s meals like Bonnie does….I also want to say that just because I don’t want to be the boss of everybody does not mean I am not the favorite Coatikid because I am………. Author RavenPosted on April 14, 2011 May 24, 2017 Categories Raven's Lair3 Comments on I have something to say……. 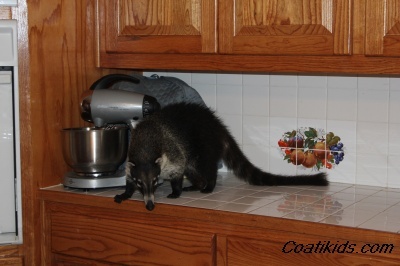 Where oh where did CoatiMom hide the treats????? I know she has them, she has lots of them. Fruit bars, peanuts, marshmallows and all for me. All because I am the favorite (do tell the others, they never believe me)! Heeeeeere…. 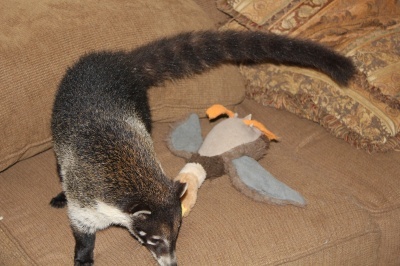 treatie treats, come to Raven……I searched and searched and all I found was Clyde’s stupid duck..
Do you know where CoatiMom keeps the treats? Honey Likes me Best!!!! Yeah, I now have my own special best friend. I can honestly say Honey and I hit it off right away. That Bonnie is soooooo jealous. That’s just her tuff luck. Honey is my new B.F.F. 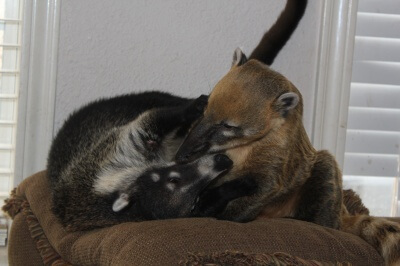 CoatiMom knows how much we like each other and let me have a sleep over with Honey last night. That girl is so Cool. 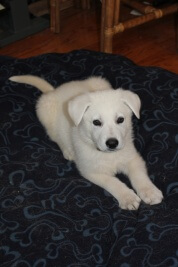 She is very smart, funny and great to spend the night with ( she doesn’t snore or hog the covers and push on me in the middle of the night like big boy Lucky does). Sleeping with Lucky is like sleeping with a manatee. Honey is smart enough to be friends with me over Bonnie. 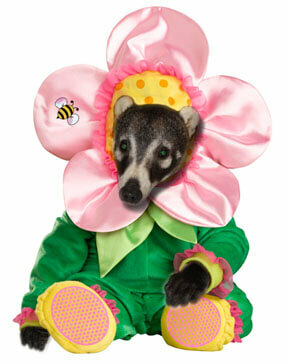 Everyone knows, one day I will be the new Coati Queen. I think Lucky has a crush on her too. That part does surprise me because I thought Lucky only had eyes for me. For the sake of my new BFF relationship, I will let that go. I am so glad Honey came to live with us, she is very special. Author RavenPosted on March 14, 2011 May 24, 2017 Categories Raven's Lair2 Comments on My Besty Beastie Buddy!! Tattletail, I’m coming for You……. 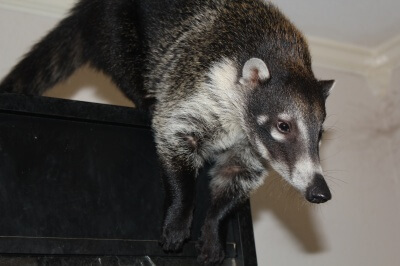 I am getting very tired of hearing how special and how much Lucky is CoatiMom’s favorite…..Especially when everyone knows I am the family favorite. Lucky just needs to stop with the tattling..not going to take much more. Lucky was just as guilty in the bathroom capers… If he doesn’t take this warning, I will pack my toys and move in with Bonnie and Clyde. 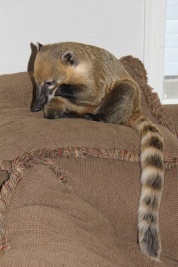 I think it’s getting time I take my rightful place as Monarch of the Coati Manor!